Washington, D.C. | January 26, 2010 | www.adc.org | Last Thursday, 54 Members of the House of Representatives led by Congressman Ellison of Minnesota and Congressman McDermott from Washington State signed a letter to President Obama asking his Administration to lift the blockade on Gaza. In the letter to President Obama, the 54 Members of Congress said “the unabated suffering of Gazan civilians highlights the urgency of reaching a resolution to the Israeli-Palestinian conflict, and we ask you to press for immediate relief for the citizens of Gaza as an urgent component of your broader Middle East Peace.” Click here to read the full letter. The American-Arab Anti-Discrimination Committee (ADC) urges you to recognize and thank these 54 US House Representatives for exhibiting leadership by contacting them TODAY. Please see below for the list. The ADC Research Institute (ADC-RI), which was founded in 1981, is a Section 501(c)(3) educational organization that sponsors a wide range of programs on behalf of Arab Americans and of importance to all Americans. GAZA, (PIC)– The government of Ismail Haneyya on Tuesday appealed to the world community to save the flood-stricken areas in Gaza Strip and to send urgently needed construction material. Ahmed Al-Kurd, the minister of social affairs, said in a press release that Gaza was the target of siege then war and now came the floods. He said that his government started implementing an emergency plan to provide shelter for 70 families who sought refuge in one of the schools. It is now necessary more than ever before to end the siege and allow entry of construction material to rebuild what was devastated by the Israeli war and the natural disasters. For his part, minister of public works and housing Yousef Al-Mansi said that his ministry’s crews were working round the clock to rescue the citizens in areas submerged by the floods. He denounced the Israeli occupation authority for opening the Gaza valley dam that led to flooding tens of Palestinian homes with rainwater, describing it as a fresh crime against the Palestinian people. The government said in a statement that premier Haneyya was personally supervising the rescue operations in the flooded areas in central Gaza Strip. Ms Livni was foreign minister during Israel’s Gaza assault last winter. Ms Livni said the court had been “abused” by the Palestinian plaintiffs who requested the warrant. “What needs to be put on trial here is the abuse of the British legal system,” she told the BBC. Prime Minister Benjamin Netanyahu said the situation was “an absurdity”. “We will not accept a situation in which [former Israeli Prime Minister] Ehud Olmert, [Defence Minister] Ehud Barak and Tzipi Livni will be summoned to the defendants’ chair,” Mr Netanyahu said in a statement. “We will not agree to have Israel Defence Force soldiers, who defended the citizens of Israel bravely and ethically against a cruel and criminal enemy, be recognised as war criminals. We completely reject this absurdity taking place in Britain,” he said. Israel’s foreign ministry said in a statement on Tuesday: “Israel rejects the cynical act taken in a British court,” against Ms Livni, now the head of the opposition Kadima party, “at the initiative of extreme elements”. It called on the British government to “act against the exploitation of the British legal system against Israel”. But she said: “Israel must do what is right for Israel, regardless of judgements, statements and arrest warrants. It’s the leadership’s duty, and I would repeat each and every decision,” Israeli media reported. On Monday Ms Livni’s office denied the reports that a warrant had been issued and that she had cancelled plans to visit the UK because of fears of arrest. The British foreign office said it was “urgently looking into the implications of the case”. Palestinians and human rights groups say more than 1,400 people were killed during Israel’s Cast Lead operation between 27 December 2008 and 16 January 2009, more than half of them civilians. Israel puts the number of deaths at 1,166 – fewer than 300 of them civilians. Three Israeli civilians and 10 Israeli soldiers were also killed. The BBC’s Tim Franks says that, privately, senior Israeli figures are warning of what they see as an increasing anti-Israeli bent in the British establishment. The greatest obstacle to a Palestinian Israeli peace settlement today is the notion of a two state solution. Never a good alternative to begin with, the two state solution has monopolized peace making efforts to the point that no other alternative is being explored. Recent history has frowned on political solutions based on the separation of people along racial or ethnic lines. Apartheid in South Africa, segregation in the U.S., the partition of the Indian sub-continent, the breakdown of Yugoslavia into warring factions are all examples of the long run futility of building fences rather than bridges. The most compelling argument against the two state solution to the Arab/Jewish conflict is the simple fact that it hasnt yet happened. The idea has been officially on the table in various versions since the 1930s. The objective conditions today are such that the likelihood of a lasting agreement of the partition of mandatory Palestine is much more unlikely than any time previously, and with every passing day becomes more unlikely. The modern history of Palestine is complex, the sources of animosity are myriad. By expending all our energy in a single direction, weve lost the ability to cut through the fogof mutual recriminations to isolate the core issues. The first prerequisite to moving forward is an open mind. Rather than trying to bend the facts to meet our ideological or emotional leanings, we need to be able to identify the sources, recognize the outstanding issues, and create solutions that will satisfy all parties. The second prerequisite is the recognition and acceptance that justice will never be achieved. Too much blood has been shed, too many lives disrupted and shattered, and far to many chains of horror woven to ever be unraveled. The goal is not justice for all but solutions for all. The accrued debts may never be repaid but the cycle of violence can and must be broken. Finally, we must recognize that a true peace may not satisfy the desires of all parties but it must address every partys needs. We live not in an age of majority rule but of minority veto. A single Jewish fanatic with a revolver was able to halt the Oslo peace accords in their tracks. A handful of Palestinian suicide bombers were able to bury the process. What are the core issues? Can they be addressed without mutually contradicting each other? On the Jewish side there is an overwhelming concern for physical security. 2000 years of persecution culminating in the Nazi holocaust have led to a situation where the Jews, both in Israel and in the Diaspora will not accept a situation that would enable a repeat of the horrors of the death camps. Along side this history of persecution is the collective memory that the so-called enlightened democracies of the world did little or nothing to aid or save the Jews from Hitlers hell. Any solution must guarantee both the physical security of the people of the region as well as that of Jews worldwide. For the Palestinians, the 1948 civil war was a catastrophe, the catastrophe. Hundreds of thousands of Palestinians were displaced from their homes. The decades leading up to 1948 were years of fear and mistrust, based on both real and imagined threats. Any solution with a chance of success must both provide for their return as well as create an atmosphere of trust and security . Any conceivable two state solution will either leave sizable, alienated and disaffected minorities in both states or will require the uprooting of tens or hundreds of thousands of people from their homes. Either scenario is a recipe for the continuation of the conflict. <!–[if !supportLists]–>1) <!–[endif]–>The land between the Jordan and the sea is the historical homeland of the Jewish People, a people with long history of discrimination and oppression. As such, the new State shall guarantee in perpetuity, shelter to any person, anywhere in the world, persecuted for being Jewish. <!–[if !supportLists]–>2) <!–[endif]–>The Palestinian refugees from the wars of 1948 and the ensuing conflicts have an unalienable right to return to their homeland. <!–[if !supportLists]–>3) <!–[endif]–>No new refugees. In the course of over 60 years homes and entire towns and villages have disappeared. New homes and settlements have been constructed in their stead. The Israeli settlement policies of the last six decades have created a situation where in most cases, the return of refugees to their original homes would either be impossible or would require the displacement of the present residents. In most cases, the reparation of Palestinian refugees shall be carried out in the framework of constructing homes and towns as close as possible to their original site without the uprooting of their present occupants. <!–[if !supportLists]–>4) <!–[endif]–>The political structure of the new state can be decided through negotiations between the elected officials of Israel and the Palestinian Authority or through any number of consultative processes. The structure, important as it may be, is secondary to a basic, unalterable social contract, guaranteeing the basic rights and responsibilities of the citizens. The new state would not be “Jewish” nor “Palestinian”, nor even Bi national. While recognizing the historical significance and encouraging the cultural development of the peoples living within its borders, it would primarily be a state, caring for the common good of its citizens, providing the services and protections necessary for life in our age. The implications of the above points are far reaching. The first point requires the Arab population to accept and internalize a Jewish connection to the land while banishing fears of displacement or marginalization. Guaranteeing safe refuge to any person persecuted for being Jewish actually provides more protection than the present Israeli Law of Return, which offers automatic citizenship to anyone defined as Jewish by religious law, but does not offer protection to those considered Jewish by anti-Semites that do not meet the requirements of Halacha. The second point should be time-limited and would require massive construction/reconstruction as well as expansion of physical and economic infrastructure. This may seem daunting but so was the absorption of over a million Jews from the Soviet Union by Israel in the 1980s. While the Jewish population will have to come to grips with the return of the Palestinian refugees, the Palestinians must accept the status quo of the Jewish settlements, both in Israel proper and in the occupied territories. Proper compensation must be made to all those that lost land to the settlements, but the no new refugee clause implies no wholesale evacuations of civilian population. The concept of government sanctioned Arab and Jewish settlements must come to an end. While it is natural that people of similar backgrounds, language and beliefs tend to stick together, choice of where to live is individual and must not be restricted on racial, religious or ethnic grounds. Communities have the right to determine their character, as long as they do not impose on the basic rights of the individual. Peace making efforts have largely focused in the past on trying to build a consensus around the center majority. The key to success will be the drafting of a plan that is acceptable to the extremes of both camps. The above plan addresses the demands of the Israeli right wing to allow Jews to live anywhere in Eretz Yisrael. It also addresses the demand for the return of all Palestinian refugees. The status of Jerusalem, another point of contention becomes irrelevant in the framework of a single state situation. At first the above proposal may seem utopian and unachievable. In addition to putting behind us a century of fear, mistrust and hatred, both peoples will need to redefine their national goals and identities. Zionism and the connection of the Jewish people to the land of Israel will need to be rethought and renewed. The concept of the Palestinian national identity will need to be reexamined in light of the new reality. The process itself, the establishment of a political and social order in the new information age is in itself both daunting and exciting. All that being said, we would do well to remember the words of Arthur Conan Doyle, When you have excluded the impossible, whatever remains, however improbable, must be the truth. as well as the words of Theodore Herzl, If you will it, it is no dream. In a report, the human rights group says Israeli water restrictions discriminate against Palestinians in the occupied West Bank. It says that in Gaza, Israel’s blockade has pushed the already ailing water and sewage system to “crisis point”. Israel says the report is flawed and the Palestinians get more water than was agreed under the 1990s peace deal. It says that some Palestinians barely get 20 litres a day – the minimum recommended even in humanitarian emergencies. The Israeli-Egyptian blockade of Gaza has “exacerbated what was already a dire situation” by denying many building materials needed for water and sewage projects.The report also noted that the Palestinian water authorities have been criticised for bad management, quoting one audit that described the sector as in “total chaos”. “Water is a basic need and a right, but for many Palestinians obtaining even poor-quality, subsistence-level quantities of water has become a luxury that they can barely afford,” Amnesty’s Donatella Rovera said. Ms Rovera also urged Israel to “take responsibility for addressing the problems it created by allowing Palestinians a fair share of the shared water resources”. Israeli government spokesman Mark Regev said “the idea that we’re taking water away from someone else is simply preposterous”. He argued that Israeli fresh water use per capita had gone down since 1967 due to efficiency and new technologies, while the Palestinians’ use had increased and more than a third of their water was wasted. If there were allegations of military wrongdoing, those would be investigated, he said. He also rejected the claim that Israel was preventing Palestinians from drilling for water, saying Israel had approved 82 such projects but the Palestinians had only implemented 26 of them. “They have received billions of dollars in international aid over the last decade and a half, why have they not invested that in their own water infrastructure>?” he asked. The report also criticised the Oslo Accords, which the Palestinians agreed to in 1993. 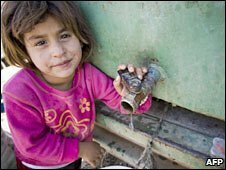 It said that under them, the Palestinians gained the responsibility for managing an “insufficient” water supply and maintaining “long neglected” water infrastructure. Also, the deal left the Palestinians paying Israel for half of the domestic water used in the West Bank, despite the fact it is extracted from the shared aquifer. Mr Regev said Israel provides the Palestinians with more water than it was required to under the accord. Is the End Near for the Right-Wing’s Vice Grip on U.S. Israeli Policy? This week, retired Marine Corps Gen. Jim Jones, Barack Obama’s national security adviser, will keynote the inaugural J Street Conference, billed as a gathering of “progressive pro-Israel, pro-peace” activists. The event marks the emergence of the moderate Jewish advocacy group that aspires to be a counterweight to the voices of the traditionally hawkish “pro-Israel” lobby in Washington. The White House’s decision last week to send Jones to address the event was a small move that might have a significant impact on the overheated politics of the Middle East. In the months before, a full-throated “swift boat” campaign had been launched against J Street in an attempt to vilify and delegitimize the group as belonging to the fringe, despite its advocacy of a moderate, or at most slightly left-of center, approach to U.S. policy in the Middle East. The conservative media offered a steady drumbeat of dubious charges, and a campaign had been under way to warn members of Congress away from the event. And it appeared to be having some impact as several members of Congress pulled out of the conference in the weeks leading up to the event (a total of 10 reportedly dropped out, according toreports, but not all in response to outside pressure). It was an attempt to nip J Street in the bud and preserve the hegemony established lobbying groups like American Israel Public Affairs Committee have long enjoyed in the halls of Congress. At stake was not only the definition of what it means to be “pro-Israel” — long synonymous with supporting the more hawkish end of Israel’s political spectrum (despite American Jews’ general tendency to lean left) — but also, and more importantly, the ability of established lobbying groups to claim to speak for the American Jewish community as a whole. It was a closely watched Washington fight, and when the White House announced that the head of Obama’s National Security Council would headline the event, it sent a powerful message, legitimizing the 2-year-old group as a voice in U.S. foreign policy debates and providing cover for wavering lawmakers under pressure to skip the conference. It signaled, to the media and other interested observers, that the J Street conference is decidedly within the mainstream. It was also another small shot at the hawkish Israeli government of Prime Minister Benjamin Netanyahu — a public rebuke of Israeli ambassador Michael Oren’s high-profiledecision to boycott the conference a week earlier — a decision that may have been prompted by pressure from AIPAC (Israel said it had concerns for some of the group’s positions but would send an “observer”). Indeed, the Washington Post framed the entire controversy surrounding the conference as a proxy war in a larger conflict between the White House and the Israeli government under right-wing Netanyahu. In sending Jones, not only did the Obama administration help J Street take the old-school “Israel lobby’s” best punches and come through standing on its feet, it did itself a service in the process. Obama has long been dogged by warnings that he risks losing support among American Jews for a range of policies — from attempts to reach out to the Islamic world, to negotiating with Iran and, perhaps most significantly, for confronting the Israeli government on the expansion of Israeli settlements. His administration is leaning on a new generation of moderate-to-progressive Jewish activists, represented most visibly at the moment by J Street, to provide political cover for him in turn. The spate of attacks hurled at J Street were intended to paint the group as “anti-Israel,” outside the mainstream and unrepresentative of the views of the Jewish community. As such, its critics claim, J Street has no right to a seat at the table on the “pro-Israel” side of any discussion of U.S. policy. But a series of polls of American Jews commissioned by the group suggest the opposite is true, that J Street’s moderate view of the Israel-Palestine conflict better reflects the views of most American Jews than those of more hawkish “pro-Israel” groups. For example, almost 9 of 10 American Jews surveyed said the administration should put pressure on both sides to achieve a peace deal between Israel and the Palestinians. And while it’s official Israeli (and U.S.) policy not to negotiate with any Palestinian entity that includes members of Hamas, 7 out of 10 American Jews would be in favor of Israel cutting a deal with a unity government that included the organization. Six of 10 oppose the expansion of Israeli settlements, “56 percent believe that military action that kills Palestinian civilians — even if it targets terrorists — actually creates more terrorism instead of preventing terrorism,” and while a majority supported Israel’s “right” to launch last year’s attack on the Gaza Strip, 60 percent of respondents said the campaign had either done nothing to enhance Israel’s security or had in fact made the country less safe. The great danger J Street represents to the long-established groups of the “Israel lobby” is that it has the potential to shift the terms of the debate in Washington — redefining the boundaries of “mainstream” discourse on the Middle East conflict. corporations who are profiting from the illegal Israeli occupation. Sept. 3 (Bloomberg) — The South African government told a judge it now supports a U.S. lawsuit accusing General Motors Corp., Ford Motor Co., IBM Corp. and Daimler AG of aiding South Africas former apartheid regime, according to lawyers. Jeff Radebe, South Africas justice minister, said in a letter to a judge that the government reversed its position and believes the case should go forward, according to lawyers at Hausfeld LLP, one of the firms representing plaintiffs in the suit. U.S. District Judge Shira Scheindlin in Manhattan in April narrowed the case while allowing it to proceed. The government of the Republic of South Africa, having considered carefully the judgment of the United States District Court, Southern District of New York, is now of the view that this court is an appropriate forum to hear the remaining claims, Radebe wrote to Scheindlin this week, according to a copy of the letter provided by the Hausfeld firm. The plaintiffs in the case, including people who were tortured or relatives of those killed, invoked the U.S. Alien Tort Claims Act, a 200-year-old law that lets federal courts hear suits by non-citizens claiming violations of international law. They say the companies knowingly helped the former South African regime by selling it weapons, providing it financing and otherwise doing business there. South Africas government initially opposed the lawsuit, saying it would deter investment, a position that was reviewed after Jacob Zuma was elected president in May. The governments decision to withdraw its opposition is extremely good news for us, said Marjorie Jobson, a director of Khulumani Support Group, which supports apartheid victims. They feel they can no longer protect the companies. Tlali Tlali, Radebes spokesman, didnt answer several calls to his mobile phone. South African government spokesman Themba Maseko said he hadnt been briefed on the case. Daimlers South African unit said it was confident of winning the case. Daimler, based in Stuttgart, Germany, is the worlds second-largest maker of luxury cars. All of the other defendants either denied wrongdoing or refused to comment when Scheindlin ruled the case could proceed. The case is In re South African Apartheid Litigation, 02- md-1499, U.S. District Court, Southern District of New York (Manhattan). What are you trying to do, start world peace? We really hope you are. We want your sharing to be fruitful and open your mind to the oneness of all beings, regardless of race. In the case of the Israelis and the Palestinians, these two tribes may be biologically some of the closest on earth. Please feel free to share your kindness, your wisdom and even your ignorance. There is no better way than by shedding light on these ideas we have that they are seen for what they truly are. We invite you to meet your host who will be Nick. He is a guy who cares about people on the other side of the world and their suffering. He has spent many years working for the welfare of others on other projects without gain for himself. We wish everyone many blessings on the path of awareness about this part of the world and how we may contribute to a sustainable peace there.